This historic late 1960s photograph, was captured inside what had been a Nigerian refugee relief camp during the Nigerian-Biafran war. 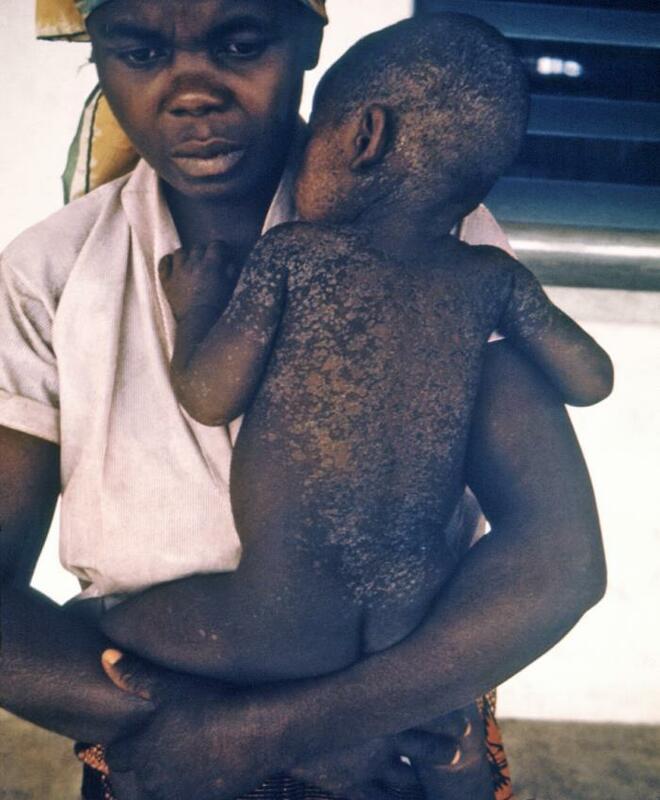 This scenario depicted a Nigerian mother and her child, who was recovering from measles. Many children were cared for in camps set up during the National Communicable Disease Center (NCDC)-led refugee relief effort during the conflict. . Measles was a constant threat in these camps, for sloughing of the skin in recovering measles patients was often extensive, and resembles that of a burn victim. Due to their weakened state, children like the one shown here, needed nursing care to avoid subsequent infections. Measles killed a number of local children, especially those already suffering from kwashiorkor, a disease due to their inadequate dietary protein intake, until Epidemic Intelligence Service (EIS) officers were able to set up vaccination programs in all of the camps.